As I find the time, I will add to this list. In no particular order (for now), these are links I think are a good place to get more information about Canada and Canadians! CBC Digital Archives (www.cbc.ca/archives/) – A real gem! Explore the past! The Canadian Encyclopedia – (www.thecanadianencyclopedia.com) – Have a question about Canada, or Canadians? Look here! Dictionary of Canadian Biography Online – (www.biographi.ca) – Lots of information on just about every notable Canadian! 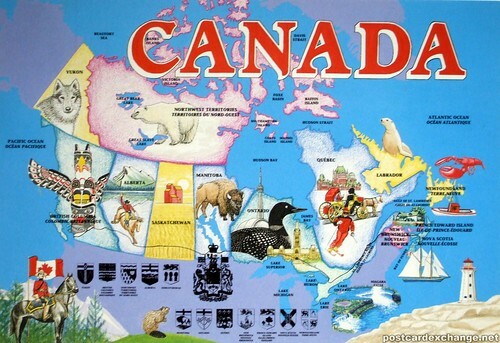 I like this map, it’s so colourful and it reflects what the symbol of each province. BC for Totem Poles. Awesome.